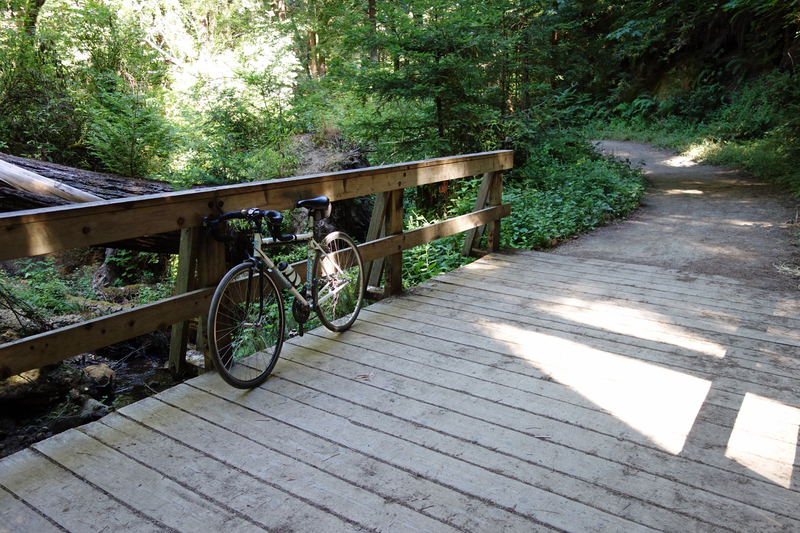 First of three bridges over Purisima Creek on the descent. Is it possible? Cyclists outnumber cars in the Santa Cruz Mountains on any given Saturday? It’s true and the disparity grows by leaps and bounds, at least based upon 40 years of personal experience. I saw bikes everywhere on my ride up Kings Mountain Road, down Purisima Creek Road, up Tunitas Creek Road. I saw five road bikes riding UP Purisima Creek Road. Good luck with that. Decades ago I could ride up that logging road, but I was young and the road was in perfect shape. Now my legs can’t generate the watts needed to make it up the steep climb (18 percent in places) on loose dirt. It wasn’t just cyclist on the trail, but hikers by the dozens, their cars spilling out from the puny parking lot and lining the paved road on the coast side of Purisima Creek. As I climbed Tunitas Creek Road into the sweltering heat I saw more dozens of riders, most going up. Gone are the days when I was the only one out there along with Jobst Brandt and friends. On the descent of Kings Mountain Road I saw a lone cyclist riding uphill, followed by six cars! The driver behind the cyclist no doubt lacks experience driving in the mountains. On that straightaway it would be easy to get by. When I encounter bike followers I slow to a crawl on straightaways. It doesn’t take long for the driver to get the message it’s OK to pass. The good news is that Purisima Creek Road has been cleared of several mud slides and a road bike can get down it without dismount. Of course, the coast weather left no doubt as to why it’s the place to be on a hot day. Glorious. 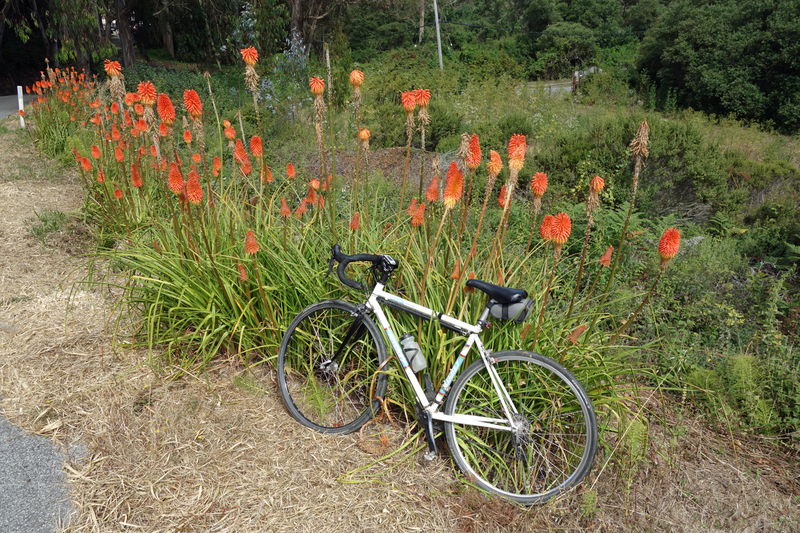 Red hot pokers, or torch lily, grow near the coast. They’re native to Africa. This entry was posted on July 16, 2017 at 8:26 am and is filed under Ride reports. You can follow any responses to this entry through the RSS 2.0 feed. You can leave a response, or trackback from your own site. Sounds like a fun route. Once at the top of Kings Mtn, do you pick up Purisima Creek Trail from the Skyline entrance and ride that down to Purisima Creek Road towards highway 1? Looks like you run tires wider than my 25cm, but I don’t mind taking it slow as long as I don’t need to dismount. That’s what I do. 28 mm tires. There’s a couple of places with rock ballast, 15 feet or so. Intense braking. My hands have difficulty in old age. Thanks for the tips- looking forward to trying this loop. Rama, it’s too bad you weren’t around in the early 1980s. The road was not officially open to the public (that never stopped us) and it was smooth, never dusty. That was generally true for all of the dirt roads and trails we rode back in the day. We had the trails to ourselves.